About six-in-ten gun owners in the United States are male (62%). Still, about one-in-five women (22%) report that they own a gun. While these women resemble their male counterparts in some respects, their views on and experiences with guns often differ from those of male gun owners. Here are seven ways that female and male gun owners compare, based on a recent Pew Research Center survey of 1,269 gun owners. 1Women who own guns tend to become gun owners at a later age than men. On average, women who own a gun or have owned one in the past report that they first got their own gun when they were 27 years old, compared with an average of 19 for men who own or have owned guns. 2 Women are more likely than men to cite protection – rather than recreation – as the only reason they own a gun. Male and female gun owners are about equally likely to cite protection as a reason why they own guns: About nine-in-ten in each group say this is a reason, and 65% and 71%, respectively, say it is a major reason. 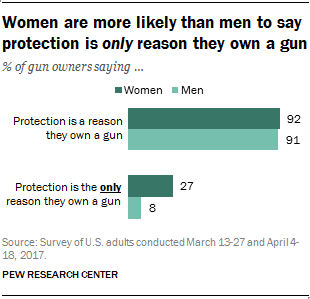 But far larger shares of women than men who own guns say protection is the only reason they own a gun: About a quarter of women who own guns (27%) are in this category, compared with just 8% of men. 3 Women who own guns are less likely than their male counterparts to say they go sport shooting or hunting, though substantial shares of women do so. About four-in-ten female gun owners (43%) say they go shooting or to a gun range often or sometimes; 58% of men who own guns say the same. And while 37% of male gun owners say they go hunting at least sometimes, 28% of women who own guns do so. The differences between male and female gun owners when it comes to participating in hunting or shooting are linked, at least in part, to early exposure to these types of activities. 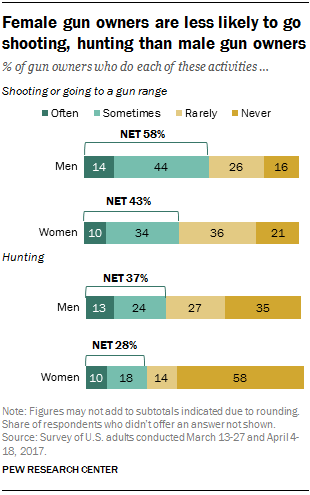 Among current gun owners, 52% of men say they went hunting and 46% say they went shooting at least sometimes when they were growing up, compared with about a quarter of women (23%) who say they participated in each of these activities when they were young. The gaps in the shares of men and women who now go hunting or shooting virtually disappear when those who did and did not hunt or shoot growing up are considered separately. 4Female gun owners are less likely than male gun owners to say they watch TV programs or videos about guns and to say they visit websites about guns, hunting or shooting sports. A third of women gun owners (33%) say they often or sometimes watch TV shows or videos about guns, compared with 43% of men who own guns. And 28% of women who own guns say they visit websites about guns, hunting or shooting sports, compared with 39% of male gun owners. Female gun owners are also less likely to be in a social group where gun ownership is the norm. Four-in-ten women who own guns say all or most of their friends also own guns, compared with 54% of male gun owners who say all or most of their friends do. 5 Male gun owners are more likely than female gun owners to say there is a gun that is both loaded and easily accessible to them all of the time when they’re at home. Some 43% of men who own guns say this is the case, compared with 29% of women gun owners. 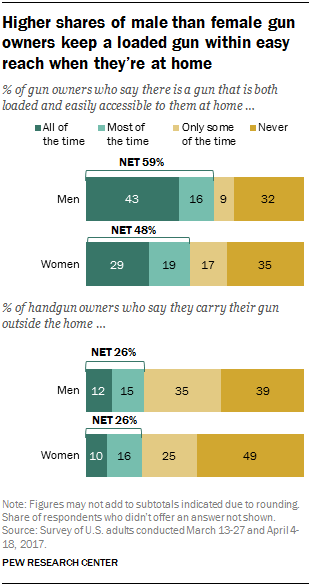 However, among those who own handguns, equal shares of men and women (26% each) say they carry their gun outside their home all or most of the time. 6Men and women who own guns are similar when it comes to how they see gun ownership. Majorities of both groups of gun owners consider the right to own guns to be essential to their personal sense of freedom (70% of women and 77% of men), and somewhat similar shares say being a gun owner is very or somewhat important to their overall identity (46% and 52%, respectively). On each of these questions, the differences between men and women are not statistically significant. 7 Among Republican and Republican-leaning gun owners, women tend to be more supportive than men of policy proposals that would restrict gun ownership. When it comes to gun policy, female gun owners express more support than male gun owners for proposals that would restrict gun ownership and less support for proposals that would expand it. These differences primarily reflect a gender gap among Republican and Republican-leaning gun owners. For example, about six-in-ten Republican and Republican-leaning women who own guns say they would favor banning assault-style weapons (60%) and creating a federal government database to track all gun sales (57%). In contrast, about a third or less of Republican men who own guns express support for each of these proposals (28% and 35%, respectively). In turn, Republican and Republican-leaning men who own guns are more likely than their female counterparts to favor shortening waiting periods for legal gun sales (68% vs. 46%, respectively) and allowing people to carry concealed guns without a permit (52% vs. 24%). Among Democratic and Democratic-leaning gun owners, similar shares of men and women express support for each of these proposals. Juliana Menasce Horowitz is an associate director of research at Pew Research Center.